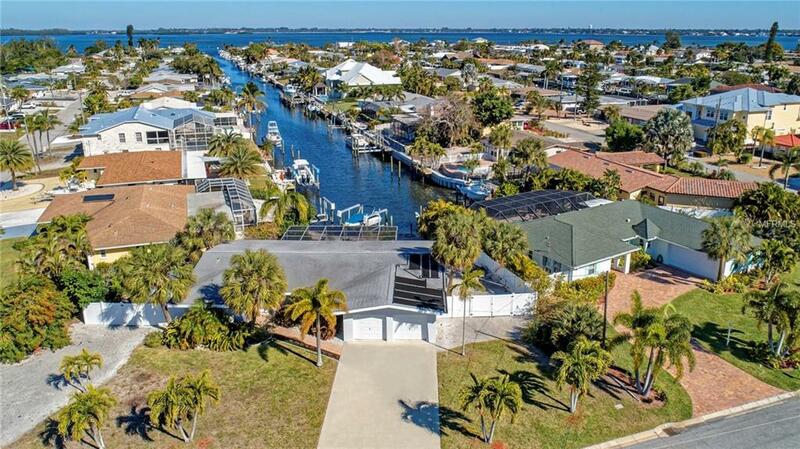 YOU CAN HAVE IT ALLEnjoy the real Florida Lifestyleboating, beaches, sun and fun in this incredible updated WATER FRONT home. From the moment you enter this fine property you will be impressedLuxurious Brazilian Cherry wood floors create a rich warm welcomea spacious open living area is perfect for social gatherings and the dining area ideal for dinner partiesThe updated Kitchen will inspire your family chef to create culinary treats and offers rich granite counters, 42 solid wood cabinets & stainless steel appliances. The split bedroom design is great for privacy and an en-suite guest bedroom is perfect as an In-Law suite or for family and friends planning an extended stay. HEATED PRIVATE POOL allows for year round swimming, Updated Electric Panel, New A/C in 2014 including all new ducts, all walls and ceilings re-textured and painted in 2010, new PVC fencing in 2017, New Shed in 2014the list of updates just goes on. And did I mention the 10,000 Boat lift waiting for your vessel to take you out to the Bay or offshore for fishing adventures?! Bike to the BEACHES of ANNA MARIA ISLAND and enjoy gentle ocean breezes, collecting sea shells and Spectacular Sunsets nightly. Sarasota is just minutes away offering an International Airport, interesting cultural events and upscale nightlife. Perfect as a seasonal winter get-a-way, full time residence OR as a weekly rental for GREAT RETURN on your investment or to help offset carrying costs until you retire. This could be your Piece of Paradise, CALL TODAY!! !